Polarized sunglasses are a necessity when fishing. In fact, some are made specifically for fishermen. They help to reduce glare from sunlight reflecting on the water and in the atmosphere. By reducing the glare, you'll be able to see fish and underwater structures more easily. Glare also causes eyestrain and eye fatigue. Good quality polarized lenses will eliminate up to 99% of the glare and protect your eyes from UV rays. 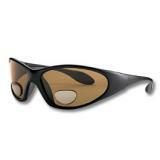 Like most fishing equipment, there are a variety of choices available in sunglasses. Be sure and explore all your options to make sure you get the pair that will be most helpful for you. Buying polarized sunglasses for fishing isn't like buying a $10 pair of sunglasses at the discount store. These sunglasses are lightweight, and made to help your visual acuity. Finding the right pair to help you enjoy fishing and protect your eyes is important. The different colors applied to the lenses do different things for you. Gray lenses are great for every day. They have very little distortion and are great for sunny days and open water fishing. Copper lenses are soothing for your eyes. They absorb blue light and increase visual acuity. This color works great for sight fishing. Brown lenses are considered the best for fishing by many anglers. It gives excellent contrast and accurate color perceptions. This color works well for shallow streams and flats fishing in bright or medium light. Amber lenses are the right choice for low light conditions like dawn or dusk, and for overcast days. While most fishing sunglasses are rather expensive, there are some less expensive glasses out there that are a good value for anyone working on a budget, or the fisherman who only needs them occasionally. Look for glasses with thermal formed polycarbonate lenses that are pre-tinted and polarized. Be sure they are strong and lightweight with durable frames. The lenses should provide UV protection and are usually available in either gray or brown. The value priced glasses should run from $25 to $75. Anglers should look for glasses that cut the glare, allowing more contrast, so you can see fish in the water with more accuracy. At the next price level you can choose from glass lenses, which provide the best visual accuracy and the least distortion. Glass lenses are ground and polished, not heat formed, which may cause distortion. These glasses block 95% of reflected light, increasing your visual clarity. Beginning with this level, you can choose prescription lenses if you have visual difficulties. You can even have them made with a bifocal prescription. Sunglasses in this medium price range are durable, easy to clean, and relaxing for your eyes. A medium price range is $80 to $150 for polarized sunglasses. High end fishing sunglasses can run you anywhere from $175 and up. Glasses in this category will have high quality glass lenses for greater acuity and less distortion. They will be treated with a substance to resist water, dust, and smudges, making cleaning in any situation easy. They should be scratch resistant. Depending on what company you choose, they may be available in prescription lenses. If they come with a bifocal option on the lenses, they should have the bifocal located below the eyeline, and be comfortable to use when tying on a fly. They should block up to 99% of reflected glare, and eliminate UV ray damage to your eyes. The hinges should be corrosion resistant and safe for saltwater fishing, as well as freshwater. Some may also come with a protective case. While a good pair of good fishing glasses may not be inexpensive, they should last you for several years, making the investment worthwhile. You will be able to see more fish, and have less eyestrain from spending the day on the water on a sunny day. A good pair will help increase your casting accuracy, because you'll be able to pinpoint where the fish are lurking. Since many are available with prescription lenses, you won't need to worry about clip-on sunglasses or wearing a larger pair on top of your everyday glasses. Shop around and find the pair you like best that fits your budget.